Caring for a person with dementia poses many challenges. We understand the challenges your family is going through. We are here to take on the burden of compassionate 24 hour care, providing you the time to rest and care of yourself. 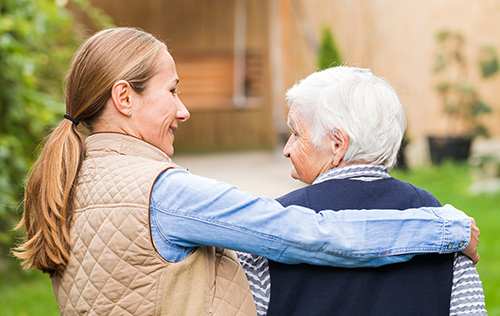 That frees you up, so you can become the care manager, instead of the round-the-clock caregiver. Our center is secure, with cameras and sensors installed to alert staff immediately, should a resident decide to wander beyond monitored areas. We provide regular exercise and entertaining programs to minimize restlessness. We maintain structure by keeping the same routines, and keeping furniture in the same places. Familiar objects and photographs offer a sense of security and can suggest pleasant memories. Staff uses gentle touch, and speak in reassuring voices. They do not try to restrain the person during a period of agitation. Instead, they keep dangerous objects out of reach, and allow the person to do as much for himself as possible—supporting his independence and ability to care for himself. Confronting a confused person may increase their anxiety, so our staff will also distract the person with a snack or an activity, allowing him to forget the troubling incident. We have a schedule of daytime activities, including physical exercise. The afternoon and evening hours are quiet and calm and include structured, quiet activity. People with dementia literally begin to forget that they need to eat and drink. The consequences of poor nutrition are extensive.Our daily routine is scheduled around several small healthy meals and snacks throughout the day. Our staff provides friendly and easy-going assistance whenever necessary and they allow plenty of time for meals. More than a third of people over the age of 85 have dementia from conditions such as Alzheimer’s, Lewy bodies, or vascular dementia. People with dementia have a progressive brain disorder that makes it more and more difficult for them to remember things, think clearly, communicate with others, or take care of themselves. Sometimes their confusion and discomfort are quite evident. Other times, they may appear to painlessly return to a more childlike mental state. It can be very painful to not be recognized by them any more. In addition, dementia can cause mood swings and even change a person’s personality and behavior to such an extent that you may not readily recognize them as the person they once were.